Bugatti confirmed that the Veyron’s successor will indeed be named after works racing driver Louis Chiron, with the car debuting at the Geneva Motor Show on the 29th of February. Bugatti President Wolfgang Dürheimer said in a news release that since the company “wanted to make the best significantly better,” the Chiron will be “the world’s most powerful, fastest, most luxurious and most exclusive production super sports car.” That’s quite a boast. With several prototypes out there already doing some final testing, not much else is known for sure about Bugatti’s second W16 monster. It’s rumored to pack 1,500 horsepower and 1,100 foot pounds of torque, reach 62 mph in 2.3 seconds and 186 mph in under 15. How much under remains a question, but the Koenigsegg One:1 will be hard to beat at 11.92 sec. Too bad K-Segg only built six of those, while Bugatti says they’ve already taken more than 100 pre-orders on the Chiron. As for the way it looks, we only have grainy spy shots to go off of at the moment, but many expect the Chiron’s design to take notes from the recent Vision Gran Turismo Concept. This would not be a bad thing. We don’t know the price tag yet either, but it’s estimated at a cool $2.5 million. Some also say the Chiron has 425 mm wide Michelin Pilot Sport PAX tires at the rear and a speedo that goes up to 500 km/h. And how about the possibility of a T-top version in 2018? Chiron rumors are just the best. 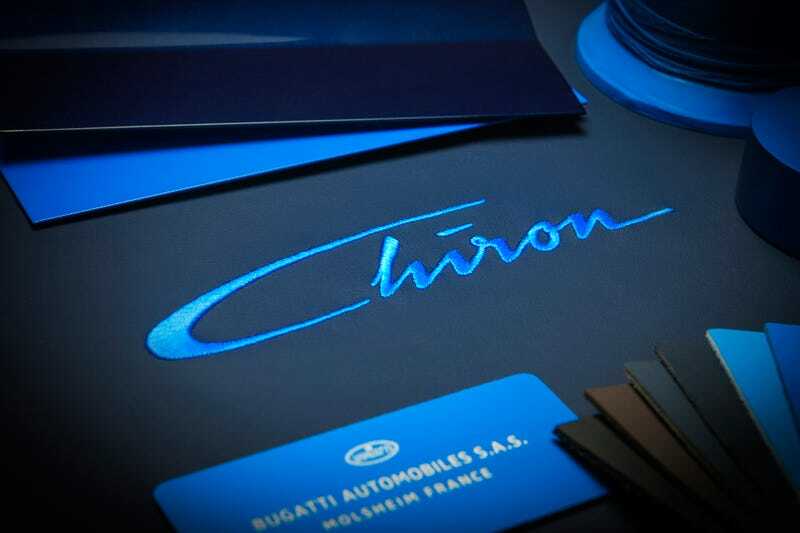 Bugatti revealed only that the headrest will feature Chiron’s signature on the headrest. That’s a start! If you see a mule, have that smartphone camera ready. Bugatti would kindly ask you to use #BreakingNewDimensions when you upload your Chiron spy shots to social media, or when you email them to Jalopnik.